Valencian Institute of Modern Art opens the exhibition "Mar Solis. Line, curve, ellipse"
The sculptress Mar Solís (Madrid, 1967) constructs from within, from the heart, making majestic, time-defying sculptures. VALENCIA.- The IVAM, inaugurated the exhibition "Sea Solis. Line, curve, ellipse". Sponsored by Urban Development, the exhibition features 48 works made between 2009 and 2012, among which include sculptures, drawings, artist books, a projection and two installations consist of multiple pieces of mahogany. Mar Solis uses the language of abstraction in her sculptures and attaches great importance to the materials. The works on display at the IVAM have been made with mahogany which has undergone a transformation process, the surface dark red to make it look rusty Corten steel. It also uses light as a transparent material which creates shadows which gives a depth of one's sculptures and the exhibition space. On the one hand there are the materials  wood, steel, aluminium or paper  and on the other, the emotions. The sculptress Mar Solís (Madrid, 1967) constructs from within, from the heart, making majestic, time-defying sculptures. To see her at work is like witnessing fragility and strength, lightness and sturdiness, air and earth. Driven by an impulse to imitate the architecture of the forests, the language of nature, with its pattern of order and chaos, she uses abstraction to define essential questions and pursue dreams, like those that now fill the rooms at the IVAM with their suggestions. She is a fashioner of signs, a maker of magic in the realm of light and shade, creating paths, transforming atmospheres and altering landscapes. "Art is an inspirer and agitator of the human soul," she declares. "Art is the ability of human beings to invent, interpret and construct the ideas they cherish." As the visitor makes his way along the paths that Mar Solís creates, amid groves of curving sculptures that eagerly invite us to pass through them, he feels he is entering a parallel reality, a bold, stimulating land where he can give free rein to his desires. This sculptress from Madrid works with lines in space and with emptiness as volume. The visitor who walks among these sculptures becomes a transformer of their atmosphere and an irrepressible generator of their movement. He is the inevitable protagonist in the search for places and viewpoints, making the work a vibrant, changeable space. Solís's works are places of reflection, abstract meditations on fragility and balance. Her sculptures have structures that write on the air lightly and transparently. Their limbs seem to be articulated and they rise in seemingly weightless equilibrium, generating unreal, symbolic spaces similar to Gothic architecture. "Everything begins with drawing," Mar Solís explains. 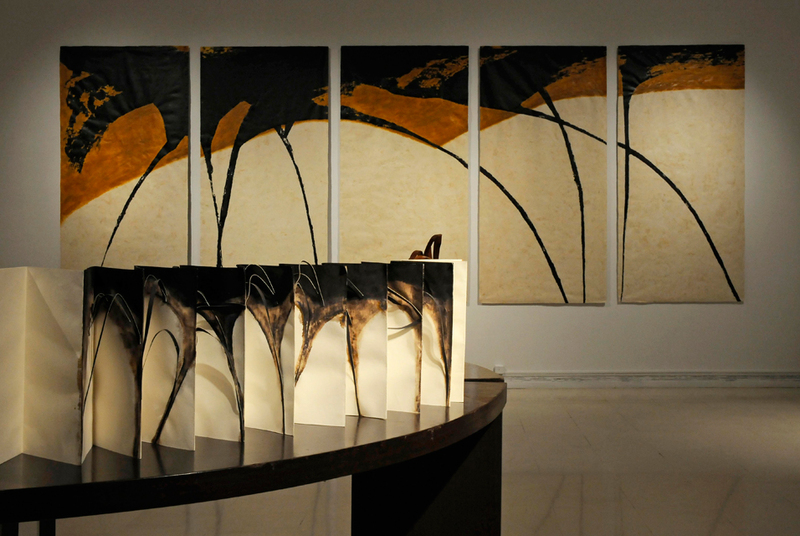 Her work on paper is the starting point for this exhibition at the IVAM. In these incursions, studies, models or sketches which in themselves are works of art, she marks out a series of lines in space, approaching emptiness as sculptural volume, seeking sense hidden among the folds and cracks, in the silence left by the hollows. They are pieces of minimal architecture that take shape and mutate as the exhibition proceeds. Mar Solís has succeeded in making the drawings in her notebooks become sculpture on the basis of a twofold rationale: the spatial aspiration that exists in all drawing, and the similar vocation that has driven Mar Solís in her work as a sculptress from the outset.